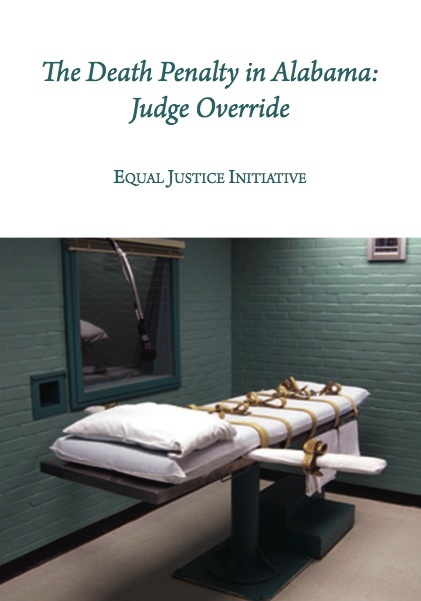 A new report from the Equal Justice Initiative in Alabama exposes the practice of state judges imposing death sentences by overriding a jury's recommendation for life. EJI's study found that judges in the state have overridden jury recommendations 107 times since 1976. In 92% of the overrides, judges overruled life verdicts to impose a death sentence. More than 20% of the defendants on Alabama's death row were sentenced through judge overrides. These sentences contribute to the high per capita death sentencing and execution rates in Alabama compared to the rest of the country. In Alabama, trial and appellate court judges are elected, often based on "tough on crime" platforms. The study found that the proportion of death sentences imposed by override often is elevated during election years. For example, in 2008, 30% of new death sentences were imposed through judge override, compared to only 7% in 1997, a non-election year. In Johnson v. Alabama--a case involving a judicial override--Justice Thurgood Marshall, wrote in dissent that "it approaches the most literal sense of the word 'arbitrary' to put one to death in the face of a contrary jury determination where it is accepted that the jury had indeed responsibly carried out its task." The report states that Alabama is unique in its practice of judicial override. Both Delaware and Florida allow death sentences by judicial override, but Delaware has no one on death row as a result, and Florida has not had such a sentence in 12 years. (A. Liptak, "When Judges Override Juries, Death is Often the Sentence," New York Times, July 11, 2011; "The Death Penalty in Alabama: Judge Override," Equal Justice Initiative, a nonprofit law firm based in Montgomery, July 2011.). See Arbitrariness and Studies on the death penalty. See also Judge/Jury Sentencing.